Former DMTC Director, Emeritus Professor John Norrish, has been made a Fellow of the American Welding Society in recognition of his distinguished contribution to the discipline. The AWS is the peak body for welding and joining technology in the United States, with about 70,000 members industry, national research labs, universities and training organisations from the US and around the world. Being elected a Fellow of the Society is a recognition of the distinguished contribution of individual members in the field of welding science and technology, in John’s case over more than 50 years. There are more details on the University of Wollongong’s website here. 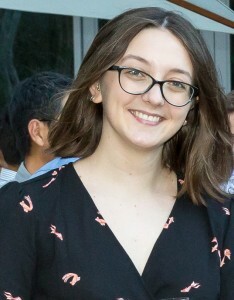 DMTC congratulates Emily Kibble (pictured below), who won the AIDN-WA Young Achiever Award for her work on preventative measures against pathogenic bacteria. The award was presented by the Australian Industry and Defence Network Western Australia this month. Emily is part of the research team at the University of Western Australia working on a DMTC project within the Medical Countermeasures program, along with research partners DST, the Peter Doherty Institute at the University of Melbourne and the University of Wurzburg. Emily is also supported under DMTC’s Education Program. As the Western Australian Young Achiever award recipient, Emily will now be among the contenders for a national award to be announced in February 2019.